Every weekend Prospect Junkies will be keeping tabs on the performances of the Top College Baseball Prospects and feeding their stats and our insights into one convenient place. #6 South Carolina traveled to Gainesville and defeated #1 Florida in game one 9-2. #15 Arizona took game one against #4 Arizona State 5-2. #2 Vanderbilt traveled to fringe top 25 team Arkansas and dropped the first of a three game set 2-1. Gerrit Cole – RHP – UCLA – Jr. 6.2IP 7H 4ER 3BB 7K. (W, 2-2). It usually takes UCLA a week to accumulate the 8 runs they scored last night. Kurt Heyer – RHP – Arizona – So. 7.1IP 6H 2ER 3BB 8K. (W, 4-1). Huge win over #4 Arizona St.
Mark Appel – RHP – Stanford – So. 6.2IP 10H 5ER 2BB 5K. (L, 1-3). The best 1-3 pitcher in the nation. Tyler Anderson – LHP – Oregon – Jr. 7IP 7H 1ER 1BB 7K. (W, 4-0). Madison Boer – RHP – Oregon – Jr. 4.2IP 4H 4ER 6BB 3K. Scott McGough – RHP – Oregon – Jr. 1.2IP 3H 2ER 2BB 3K. (L, 0-2). Andrew Triggs – RHP – USC – Jr. 4.2IP 5H 4ER 2BB 5K. (L, 2-2). Erik Anderson – RHP – California – Jr. 8IP 1H 0ER 4BB 6K. (W, 4-1). Sam Gaviglio – RHP – Oregon State – Jr. 7.2IP 6H 2ER 2BB 11K. (W, 5-0). First runs Gaviglio has given up after 41.2 straight scoreless innings. Sonny Gray – RHP – Vanderbilt – Jr. 8IP 6H 2ER 4BB 12K. (L, 5-1). Tough luck loss on the road against Arkansas. Brian Johnson – LHP – Florida – So. 5.1IP 8H 6ER 2BB 5K. (L, 4-1). Michael Roth – LHP – South Carolina – Jr. 8.1IP 10H 2ER 2BB 6K. (W, 5-1) Monster win against #1 Florida. DJ Baxendale – RHP – Arkansas – So. 2.1IP 3H 0ER 0BB 2K. (W, 5-0). Kurt McCune – RHP – LSU – Fr. 9IP 6H 3ER 1BB 7K. (W, 4-0). Freshman has been a pleasant surprise. Cory Luckie – LHP – Auburn – Jr. 6IP 8H 6ER 0BB 6K. Alex Meyer – RHP – Kentucky – Jr. 6.2IP 7H 4ER 6BB 8K. (L, 3-3). New found control now lost again. Taylor Jungmann – RHP – Texas – Jr. 9IP 4H 0ER 1BB 7K. Texas would go on to beat Oklahoma State in 15 innings 1-0. Bobby Shore – RHP – Oklahoma – Jr. 4.1IP 3H 1ER 2BB 4K. Matt Stites – RHP – Missouri – Jr. 6.2IP 7H 1ER 4BB 5K. John Stilson – RHP – Texas A&M – Jr. 8IP 7H 0ER 2BB 7K. TJ Walz – RHP – Kansas – Sr. 7.2IP 4H 1ER 1BB 10K. Logan Verrett – RHP – Baylor – Jr. 7IP 8H 4ER 2BB 7K. Sean Gilmartin – LHP – Florida St. – Jr. 6IP 4H 0ER 1BB 4K. (W, 5-0). Patrick Johnson – RHP – UNC – Sr. 6IP 6H 5ER 1BB 4K. Cory Mazzoni – RHP – NC State – Jr. 9IP 4H 0ER 2BB 10K (W, 2-2). Big step forward to completely shut down #19 Clemson. Mark Pope – RHP – Georgia Tech – Jr. 7IP 7H 2ER 1BB 9K. (W, 6-0). 2 earned runs is more than he’s given up all year and caused his ERA to ballon to an embarrassing 0.59. 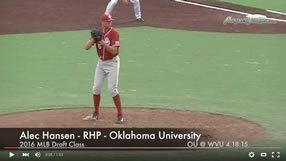 Hyle Hansen – RHP – St. John’s – So. 7IP 1H 1ER 5BB 10K. (W, 3-2). Brian Dupra – RHP – Notre Dame – Jr. 7.1IP 8H 0ER 2BB 9K. Matt Barnes – RHP – Connecticut – Jr. 9IP 4H 0ER 0BB 6K. Moved to the Friday role a few weeks too late. Kyle Winkler – RHP – TCU – Jr. 8IP 5H 1ER 3BB 9K. TCU loses to Houston. Anthony Meo – RHP – Coastal Carolina – Jr. 6IP 3H 0ER 1BB 3K. (W, 2-2). Andrew Gagnon – RHP – Long Beach State – Jr. 6IP 6H 2ER 2BB 8K. (W, 3-3). Long Beach State has had an up and down season thus far. Ryan Carpenter – LHP – Gonzaga – Jr. 7IP 6H 1ER 3BB 3K. (W, 2-1). Impressive team win against #17 UC Irvine. Carson Smith – RHP – Texas State – Jr. 7IP 4H 0ER 3BB 8K. (W, 3-1). Andrew Chaffin – RHP – Kent St. – So. 9IP 4H 0ER 0BB 15K. (W, 3-1).